As a strategist, leadership coach and passionate horse lover, managing fear is a regular topic with clients, me and my horses. Healthy fear keeps you safe, helps you make good decisions, build competence, and grow. Unhealthy fear can suffocate your dreams and get you stuck in a torment of self-criticism, anxiety and despair. Managing fear is a leadership issue and requires you to lead yourself well and understand what is required to lead others to a peaceful state. My ex-racehorse Lemon Squeezy is quite fearful and spooked at everything when we started working together this year. I also had some trepidation even though I’ve worked with horses all of my life (I have a titanium rod in my femur from a bucking crash years ago). I’ve had to dig deep in myself to be a leader he respects and trusts. I’ve had to do the same thing to start and build businesses and lead corporate efforts. The process for managing fear is the same regardless of application. From my work, I’ve identified four phases of fear and what is needed in each phase to “ride it through” to peace. 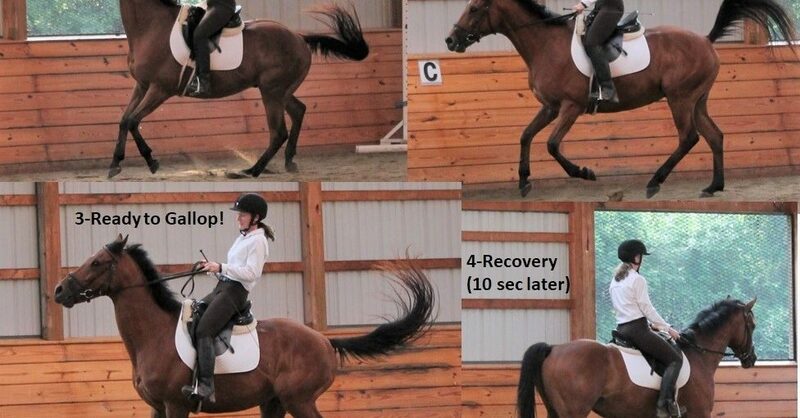 My ride with Lemon Squeezy serves as a metaphor to illustrate this process. It’s best to consider these phases when you’re calm so your brain can assimilate the process and prepare to deal with a fear trigger. 1. Fear triggers (see photo 1 of Lemon Squeezy spooking at something outside the window). This can happen at work, at home, anywhere, and at any time. It throws you off balance physically, mentally and emotionally and your head begins to spin. Notice it. What is true about this situation? How else can I think about this? What does it feel like if I take the emotion out? What would give me more peace? Ponder your responses and keep breathing. Much of the time, the fear will pass at this stage since the energy and emotion has moved from your fight/flight/freeze limbic system of your brain to your more rational frontal lobe. But if your fear blows by this exercise, you’re probably in phase 3. If you are in physical danger, move to a place of safety or immediately take action to be more safe as described in phase 3. 3. 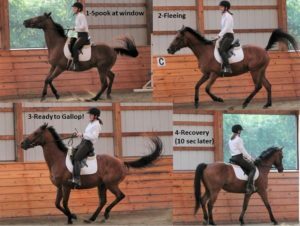 Fear takes over and “gallops off” with you (see photo 3). At this phase you must step into a powerful leadership position and put a stop to the fear before it gets out of control. Often saying “STOP NOW!” to yourself works. Make yourself pause. This is what I’m doing with Lemon Squeezy – he was not convinced that he was safe and was preparing to escalate the situation. I had to take a pretty firm hold and leverage my body weight to get a response. The same thing can happen at work or in another area of your life. Where do you need to be more assertive? What are you tolerating? Put a stop to it and take back control! This is much easier said than done and takes practice. Start small and practice using the “STOP NOW” command for simple things to build this muscle. 4. Fear is transformed to peace. You face your fear from a new perspective and balance point and let it go (see photo 4). You make peace with it, recover and carry on. This is critical. Lemon Squeezy’s fear event lasted less than 10 seconds and when we walked back to the window to assess the situation he exhaled deeply. The rest of our ride was calm and relaxed, even when passing by the window. However, if I had held on to the fear by expecting him to spook, he would have felt it and been triggered every time we passed the window. Let fear go and allow peace to emerge. Managing fear is a process. No matter what, do not let fear steal your dreams. Work through it. Give yourself what you need to feel safer. Competence and peace are worthwhile pursuits. Shari J Goodwin is a business strategist, leadership coach, author, speaker, and equine specialist. She and her husband live on a farm Virginia with three rescue dogs and five horses. Do You Have a Divine Partnership?